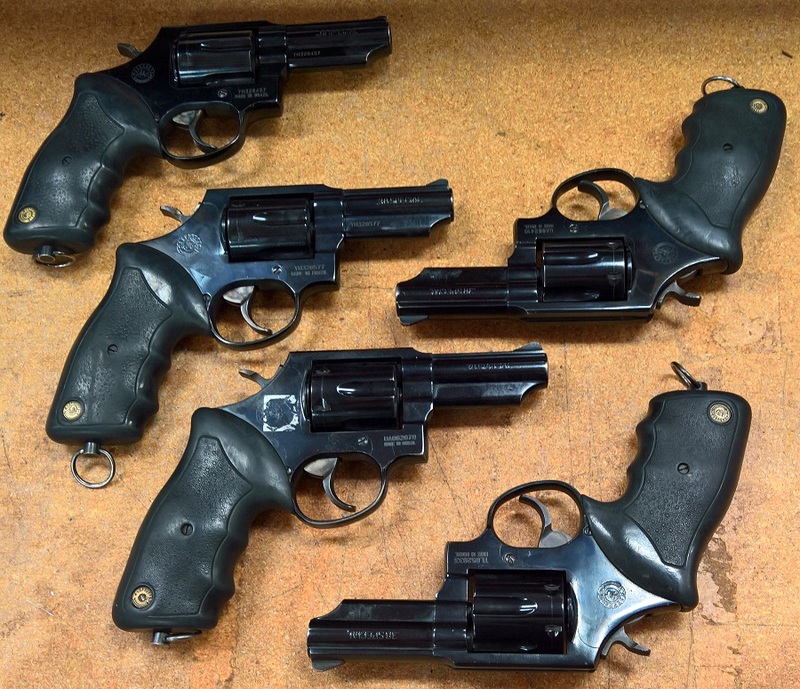 I have just gotten my hand on a bunch of surplus Taurus model 82 revolvers. 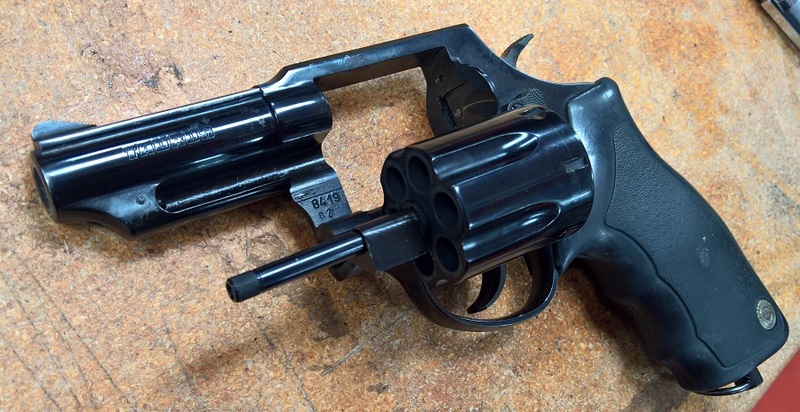 These revolvers are extremely similar to Smith & Wesson Model 10 and similarly popular with police departments around the world - especially the ones who cannot afford real Smith & Wessons. Which is where I suspect Century Arms - the importer - has gotten this shipment. They have imported them in the past, but they were in terrible shape - so bad that the Century salesperson was actively dissuading me from buying them. This time, however, the guns were in a top notch condition. I am a sucker for a good deal, and the price was super cheap, so I kept five of them for myself. 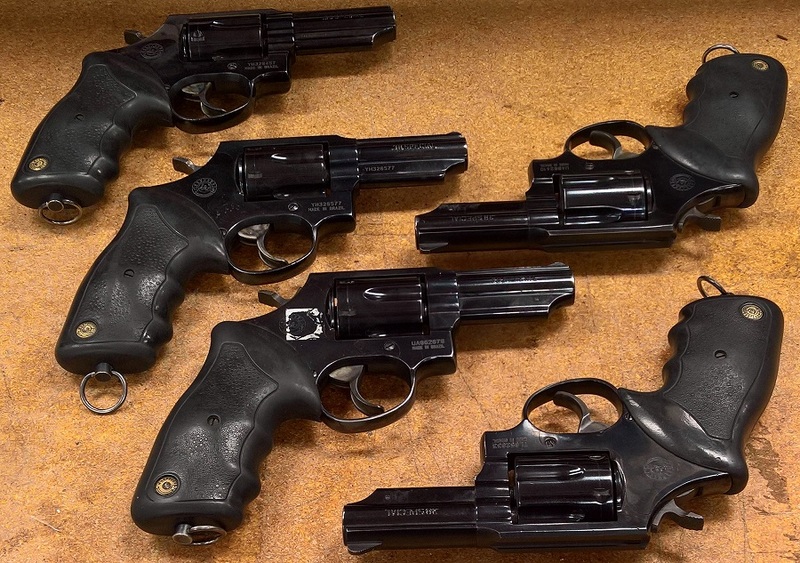 Though I had Ryan select them for me, he said that all of the guns were extremely similar, so what I got does not differ materially from what was left at the store. But here are the pictures. 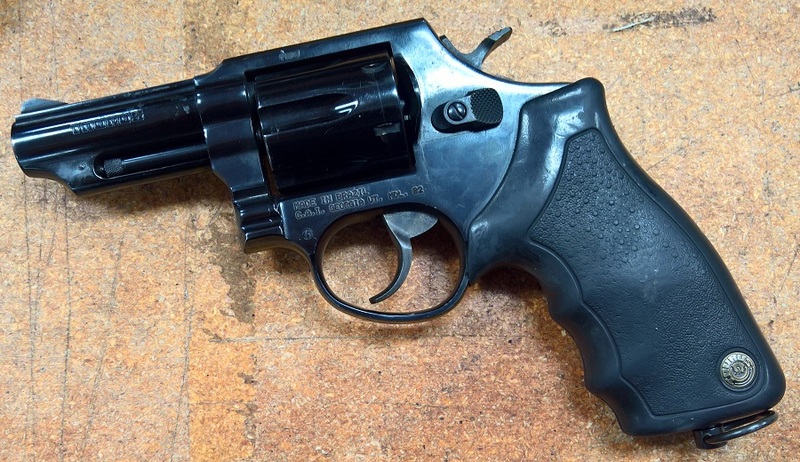 They have 3" barrels, fixed sights, and really nice royal blueing with almost no signs of wear (one of my guns had slight holster wear on the barrel). The bores look new. One of the best thing about these guns - the triggers are exactly the same as Smith & Wesson triggers - fantastic! 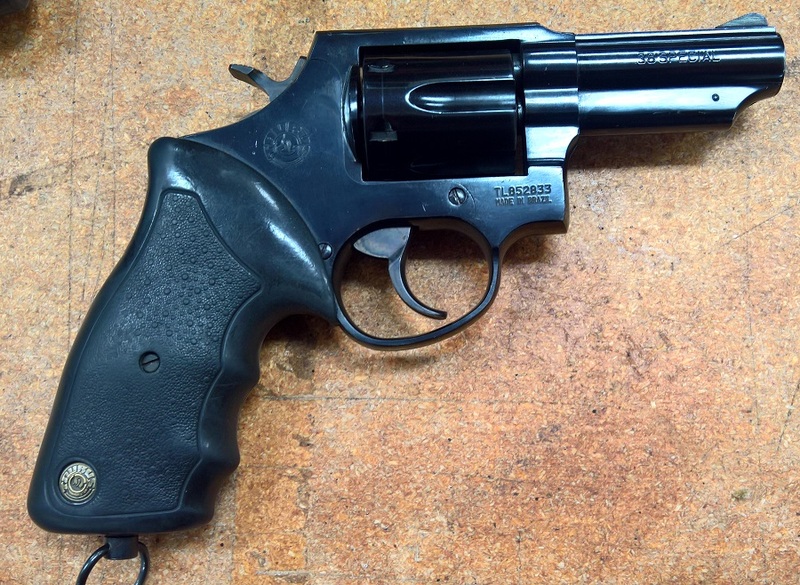 Single action is very light and breaks like glass, and double action is nice and easy. 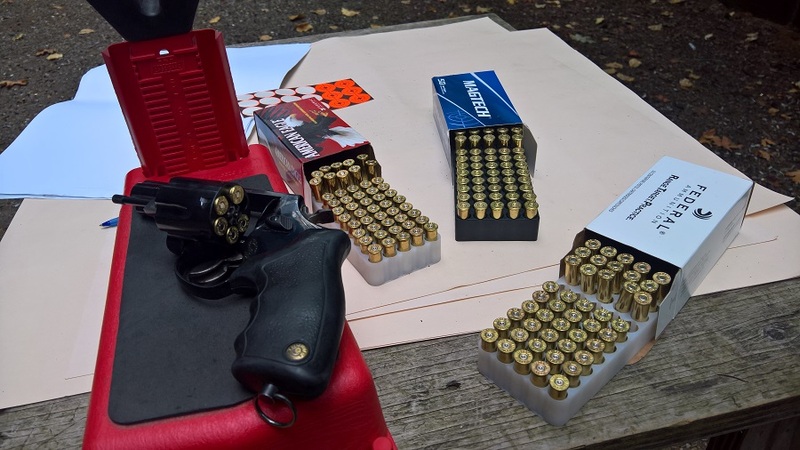 I took all five to the range, along with a box of Magtech, Federal RTP, and American Eagle ammunition, as well as half a box of my own "classic 38" reloads - 148gr wadcutter bullet over 2.8 grains of Bullseye. I shot all of them from the rest at 10 yards. The groups (of five) varied from 1" to 2.5", though vast majority were between 1.5" and 2". The worst was Magtech with the biggest numbers of groups above 2" - apparently Brazilian guns hate Brazilian ammunition. The best were my reloads, all of which were between 1" and 1.5". To be fair, majority of the above 2" groups were produced when the light conditions deteriorated towards the evening, so some of them may be my fault. Unfortunately, as you can see, some of the guns shot up to 2.5" off target with some types of ammunition. At first, I thought that it was the new shooting rest which I did not fully calibrate on other guns - because the first two guns shot below and to the left. But then one gun was pretty close on target, and two guns were shooting to the right, so it was clearly not the rest (or me). 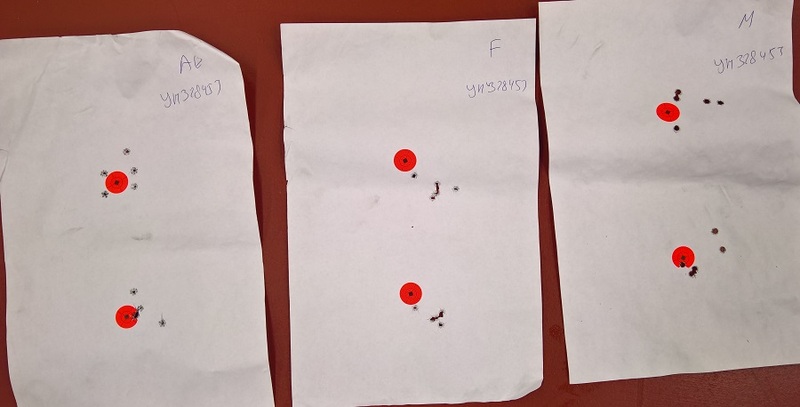 The good news is that how much the gun shot off target depended a lot on ammunition. 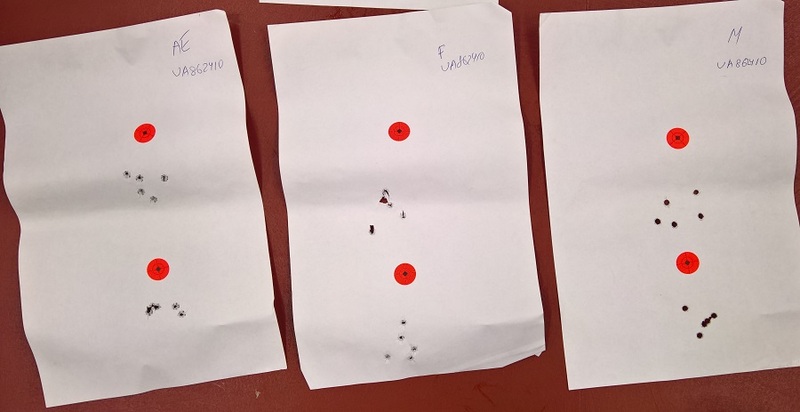 For example, one revolver (the picture with 4 targets) shot far down and to the left with Federal RTP, but only 1" off target with my reloads. 1" at 10 yards is only 2.5" defection at 25, but 2.5" at ten put the point of impact 6" off target at 25 - hardly acceptable. 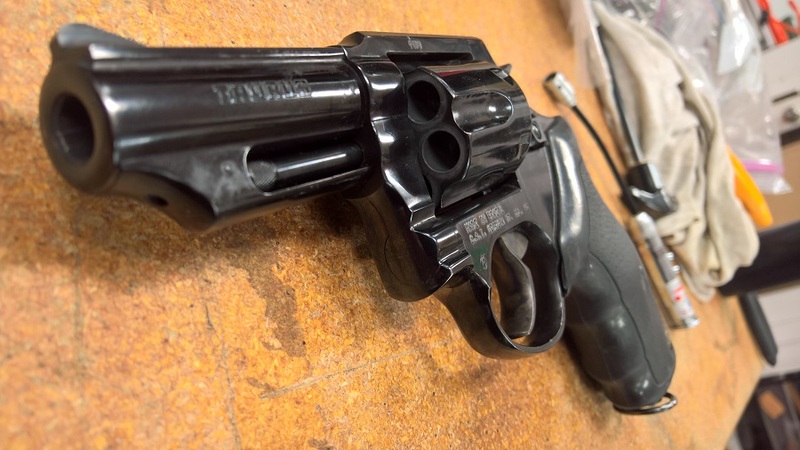 Unfortunately, when buying a surplus gun with fixed sights - and all police surplus revolvers I have ever seen had fixed sights - you have to be prepared for this eventuality. The guns are not on warranty, and cannot be sent back to the manufacturer. That's why they are half the price of the new ones. To compensate for the horizontal POI drift, the rear sights can be filed a little bit. Trying to compensate for vertical POI difference is almost impossible - because it will vary with the load and the distance, and because moving the POI up would require filing down the front sight. My next step would be to take the worst gun of the bunch and experiment with the load and the sights to get it on target at 25. Stay tuned!